Property Portfolio | Michel Associates, Ltd.
Our Portfolio consists of over 66% repeat developers and contains properties located in Urban (27%), Suburban (29%) and Rural (44%) areas. 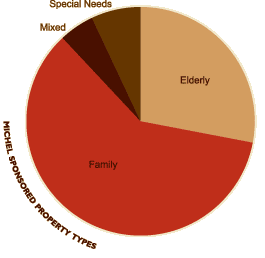 We invest in affordable, family, special needs and elderly properties (see chart for breakdown). In general, these properties have some level of federal, state or local government subsidy including, but not limited to, soft debt, subsidized rents, below market mortgage interest rates and real estate tax relief to ensure ongoing economic viability through the compliance period. All of the Tax Credit properties in which we invest have industry standard guarantees from the General Partner(s) including Operating Deficit Guarantees commensurate with their level of experience, financial strength and size of the property. Our Investment Partnership structure allows us to efficiently utilize upper-level reserves through the compliance period. Conduct site inspections and provide reports regarding construction, occupancy and maintenance of the physical appearance of the Apartment Complex. Monitor the Operating Partnership compliance with the provisions of Section 42 of the Code and, as applicable, Section 47 of the Code. Monitor the Operating Partnership reporting of operational results of the Apartment Complexes in the form of quarterly occupancy, cash receipts and cash disbursements reports and other books of account. Assist the Operating General Partner in preparing and providing to the Limited Partner the reports required under the Investment Partnership Agreement. Review the tax returns prepared by the certified public accountants of the Operating Partnership, and provide the Investment Partnership with the required annual tax information.